Featuring a pleasing flavor that's not too strong and not too sweet, these roasted espresso coffee beans covered in a layer of decadent dark chocolate provide the perfect ending to any meal. Each DaVinci Gourmet dark chocolate covered espresso bean has a slight crunch and is filled with robust espresso flavor that will energize and refresh guests as they leave your establishment. Simply drop these espresso beans off with the check as a way to thank guests for their patronage, and they'll feel a sense of appreciation for your business. Love these chocolate espresso beans! We put them in a machine and charge 25 cents for a couple. Beware ordering in the summer. The first batch came in melted in one blob. Of course Webstaurant made it right and sent a replacement with a ice pack. Yum these dark chocolate covered espresso beans are such a great treat to have and are so fun to munch on. It's very hard to stop eating these as they are very addicting to eat. I absolutely love these dark chocolate covered espresso beans! They are better than anything I have purchased in store or online and they are so much CHEAPER. These dark chocolate covered espresso beans are absolutely fantastic. The espresso beans have a thick coating of dark chocolate, way better than buying from the grocery store. Hands down, these are the Best espresso beans. A very rich and robust flavor, inside and out. DaVinci top quality product at a very reasonable price. These are one of the best espresso beans I've tried. They are the perfect mix of bean and chocolate. , not to thick . its perfect. and they arrived perfect looking. 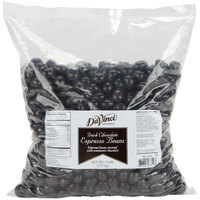 Terrific style dark chocolate espresso beans that are wonderful and great for our sweets shop. We use them to decorate our fudge and also sell them by the pound. These DaVinci Gourmet dark chocolate espresso beans are delicious! They've become a great seller and are easy to divide out into smaller bags for resale. Although the chocolate on these beans taste great, it is far too much. They're about the size of a half-dollar, much too much chocolate and not enough being. We bag and sell these at our coffee shop, and appreciate the better price than we would get through another supplier. The chocolate and the crunch are both great! These are delicious! There is a nice thick coat of chocolate around the espresso bean. We portion them out in smaller bags and have it right on the counter. Great add on item! WE USE THIS PRODUCT IN THE TASTING ROOM FOR A CLIENTS AND WE GET RAVE COMPLIMENTS. mY ONLY SUGGESTION IS TO PUT IN 1 POUND INCREMENTS SO THEY WOULD STAY FRESH. I missed going to coffee houses in my younger years and finding chocolate covered espresso beans. I don't have to miss them any longer! My customers love these! These are excellent as an impulse buy item at the counter of our coffee shop. We sell them i half pound bags, and no one complains about the price. Wonderful price for five pounds of dark chocolate covered espresso beans. They taste great and are perfect for adding to mixes or topping our espresso drinks. These dark chocolate covered espresso beans are beyond delicious! The dark chocolate is sublime and the texture with the crunchy, spicy espresso bean is a winning combination. 5 lb bags last a long time and the product is always fresh and wonderful. A great quality dark chocolate covered espresso bean from DaVinci that are great for garnishing our tiramisu. The beans are fresh and make a great snack as well. These taste fantastic! Love the crunch of the espresso bean... gourmet taste at a good price. We divide these up and sell them in three ounce and six ounce portions. Truly a customer favorite! We have many return customers coming into the shop as well as calling to place an order for us to ship. These dark chocolate covered espresso beans are still sweet enough to off set the espresso beans. We package them up in about 5 oz portions to sell. The aroma from these chocolate covered espresso beans alone makes them worth purchasing. The beans were slightly bigger than I anticipated, but they're still delicious. I love these DaVinci gourmet dark chocolate espresso beans they're covered with semi-sweet chocolate and a lot of it they come in a 5-pound bag the chocolate is delicious! I love these for a quick burst of energy and a delicious treat. The chocolate is delicious and the espresso nice and bold. These are my favorite brand. Great espresso beans! highly recommended. will order again. they smelled great and were very fresh. easily can be smelled in the room. the taste was awesome pretty good for this deal. Out of all of these Davinci espresso bean varieties, dark chocolate has to be my favorite. It complements the coffee flavor so well. They are a match made in heaven. I used to eat boat loads of these chocolate covered espresso beans at my local coffee shop. They taste great and I prefer the dark chocolate coating to the other varieties. At our coffee shop we would top our blended drinks with whipped cream and a coffee bean. Everyone loved them. Customers loved them so much that we started selling them on their own! These were Okay- as far as quality. . Some were discolored- the chocolate, but they were OK- would probably buy again and use for our cupcakes and cakes. These are great. My customers really like them and keep coming back for more. I have ordered from different companies in the past but they have not been as good as these. This is my favorite pick me up snack! It satisfies by coffee AND chocolate cravings. I highly recommend to have these on hand at work! A nice garnish for cupcakes or cakes. It is a lot of chocolate on top of the espresso bean so the coffee flavor is mind but the texture is pleasant. This bag should come with a warning ~ "May become addictive". The layer of chocolate surrounding the espresso bean is thicker than the brand we used to buy, and we have found that most of our guests prefer the DaVinci brand. These are very fresh and very good! Our customers really like the ratio of chocolate to espresso beans. They will be the only I order from now on! I used these chocolate covered expresso as a pick-me-up and an encourager for my employees. If they landed a big sale or if they seemed to be a little sluggish they would find a bag of these chocolate covered expresso beans along with an encouraging note. Not only are they delicious and reasonably priced, they are also unique and my employees love them! Pretty good product must be frozen if not all used right away or will go stale but other than that makes a great energizing snack. First off when these beans arrived a significant portion of them were melted, the packaging wasn't even placed in a way to prevent that. Once I opened them up and removed the melted beans I tasted one, they aren't even that good. Now that's not to say that these are bad, just that you can probably find much better for the steep price. The ratio of bean to chocolate is a bit much (on the chocolate side) making them large and bulky. I would buy from another online dealer next time. Thank you for your review! A Customer Solutions Representative will be in contact shortly. We're sorry to hear these espresso beans did not meet your expectations. we have a coffee ,sandwich shop and wanted to offer something different theses tasty little espresso beans are a hit with our customers,if I can keep the employees out of them..L.O.L.